No Fenders -Formula 1, IndyCar and A Whole lot more..: RETRO: Old Racing Cars Unearthed, but does Anybody care? RETRO: Old Racing Cars Unearthed, but does Anybody care? I will NOT try recounting the whole sorrid, sorted and epically SAD affair known to us Open Wheel Racing 40-somethings with Computers - a long forgotten nod to John Barnes motivational skills; Ja Volt! We have ways of making Fans outta You; YIKES! Err, regressing past Mr. Barnes eloquence; Hmm? Where'd he go, eh? Uhm, the issue I was referring to will forever indelibly be known to my generation of Open Wheel Racing Devotees Simply as THE SPLIT! As I had to say for the first time ever, when sitting down to scribble some more of this story a freakishly L-O-N-G 5yrs ago - I thought to myself what an EXTREME WASTE of time that was! Which today seems even more STUPID! November 15, 2004) Kalkhoven & Forsythe purchase Cosworth Engineering from Ford. Feb 14, 2008) CCWS Board of Directors authorizes Bankruptcy. Feb 22, 2008) Unification consummated between CCWS & IRL in Memorandum Of Understanding. March 6, 2008) CCWS Chapter 11 Bankruptcy filed in Court. June 3, 2008) CCWS Bankruptcy completed. October 31, 2008) Kalkhoven & Forsythe sell Champ Car Atlantics series to Atlanta entrepreneur Ben Jonston. This yearning simply revolves around having Indy Car return to Thy Pacific Northwest, albeit, even if IndyCar came back, now after soon to be nine years absence; Chirp-Chirp; Bueller? I just cannot see how IndyCar will ever rise to such heights once again ever! Alas, when I began preparing this for the other 100th running; Err Centennial 'Wayback in Twenty-eleven, as obviously time flies when you're a S-L-O-W typer; Hooah! Yet, having lived ‘N participated in The Split, originally a feverish Champ Car supporter due to Portland International Raceway being my Home-track, we'd already told the IRL, and more notably 'Ol 'TG (Tony George) where to stick I-T when they'd sniffed around obtaining the Portland race contract previously, which in hindsight wasn't such a great move for the Pacific Northwest! As just who was this Ben Johnston, what about this proposed rival Open Wheel Racing series and where did the missing Indy Cars and Cosworth lumps go? As inquiring Minds wanna Know, right? As I'll hopefully get to the bottom of this in Thy riveting conclusion, which starts now! What's that famous line Thy legendous' PT Barnum once Quipped: "There's a Sucker Born every Minute!" Which for Mwah seems to somewhat sum up the aspirations of the for Mwah, Mystery Man of Atlanta, GA residence. Apparently a one Mr. Ben Johnston of Atlanta, a proclaimed media advertising mogul decided to spread his empire further, for which it appears that Kevin Kalkhoven and Gerald Forsythe were only too happy to oblige. As it seems that this was just one more step in the lengthy process of truly unifying Open Wheel Racing in the good 'Ol US of A. Thus, after today's IndyCar series had completed its first unified season, we know that Kalkhoven and Forsythe sold their former Champ Car Feeder Series, now renamed simply Formula Atlantic to Mr. Johnston, most appropriately on Halloween! Interestingly, a week previously, it was divulged in Savanna that Mr. Johnston was in talks to host the inaugural Green Prix USA race weekend on Hutchinson Island, Georgia over the forthcoming 2009 St Patrick's Day weekend. As Hutchinson Island had previously held the short-lived Dixie Crystals Grand Prix 'Wayback in 1997, which featured what was then the first incarnation of Indy Lights, and was won by an aspiring Brasilian racer named Helio Castroneves. Yet the event held upon the island's two-mile road course was "One 'N Done" due to financial difficulty, i.e. ; the event's organizer having filed for Bankruptcy immediately following the race! Also according to the story's author Adam Van Brenner, Johnston had purchased 23 various Champ Cars, i.e. ; Panoz and Reynard's for his Green Prix series and planned 10-12 races beginning on March 15, 2009 in "Eco-friendly" powered vehicles supported by a local company named Panoz. While presumably the Formula Atlantics purchase was intended to be a support series, a la CART/Champ Car and the IRL series formats. Now in further hindsight there seems more than one Fly in this Ointment; Err Waiter, there's A Fly; Oh Never Mind! As I'm quite uncertain how he'd have gotten teams and drivers ready for his ultimately Stillborn race situated in under five months time. Yet obviously the largest sticking point was the fact that like Champ Car previously, Mr. Johnston didn't have an engine supplier. Or even worse yet, NO STINKIN' ENGINES! 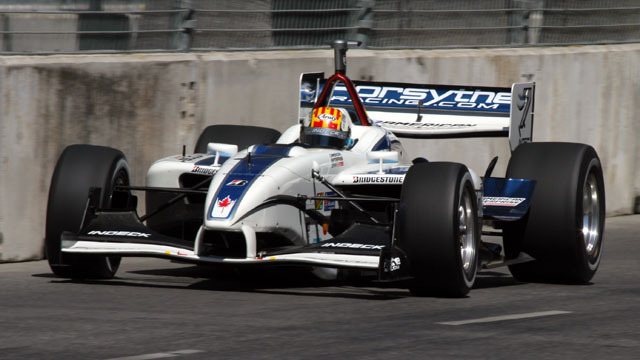 Ironically, according to longtime IndyCar reporter John Oreovicz, upon Champ Car World Series LLC filing for Chapter 11 Bankruptcy on March 6, 2008, its largest Creditor was engine supplier Cosworth, claiming a debt of $1.825 million while naturally, the majority owners of CCWS, i.e. the renown Smiley Face Kalkhoven and Cosworth cohort Wimpey! (Gerald Forsythe) had signed a NO Compete clause during the Mergification of the two warring factions. Also, just by co-inky-dense? 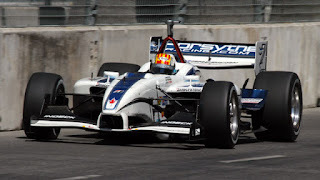 A holding company named Aquarium Holdings LLC, who controls some motor race called the Long Beach Grand Prix was assured the continuation of its race provided Kalkhoven & Forsythe successfully completed the holding of what ultimately became Champ Car's very final race on the streets of Long Beach, California whilst the media was Uh-wash in Danica Mania for having just won the Motegi Oval race; BARF! Whilst Kalkhoven & Forsythe would be paid a further $2m apiece(?) upon completion. Where things get murky understandably, as obviously the "Powers-to-Be;" Err Power Brokers, most notably some entity called Hulman & Co. certainly didn't wish to see another Split occur, or delusion of its current Mergified product still then in its infancy. Hence, subsequently, the March 15, 2009 Green Prix USA Savanna race was cancelled, which effectively killed the proposed racing series, which ultimate plans called for an all-electric propelled series which sounds eerily similar to today's Formula E championship abroad - who've just competed Yuhs guessed I-T! Ditto Long Beach. Meanwhile, The Champ Car Atlantic Series presented by Cooper Tires - and Breathe! Continued on in Twenty-oh-Seven for the first two races under Kalkhoven & Forsythe's leadership before the remainder of the season was run under the IMSA banner before being sold to Johnston just weeks after the season finale, having just concluded its 35th Anniversary! The new Atlantic Championship then ran one more season under IMSA sanction when John Edwards, the racer, not the Politician; Hooah! Won the title. Unfortunately, next the once mighty Feeder Series sadly placed itself on hold just two weeks prior to the '09 season opener, effectively eliminating the Mazda Road To Indy's last serious competitor, which now like Indy Cars features a single entity for aspiring youngsters to progress up the ladder of single seaters ultimately to someplace at 16th & Georgetown in Indianapolis. But what about those missing Panoz DP01 Champ Cars Y'all might be pondering, if you're still with me, eh? For which Marshall Pruett of Racer magazine fame solved for us "Justin-time" for Santa Claus's arrival last December. As Pruett divulges that Buddy Campbell sent him a host of pictures revealing several dusty Panoz DP01's and Reynard's in a warehouse, after Mr. Johnston's ex-wife, in divorce proceedings had had Tow Trucks dispatched to said warehouse to impound said "missing" racecars which now reportedly will go up for auction sometime soon, if these proceedings haven't occurred already?